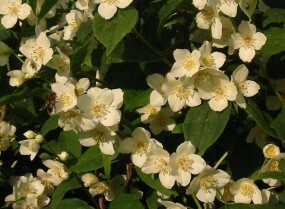 PHILADELPHUS CORONARIUS (Mock Orange). Hedging Plants, Trees, Shrubs and Conifers. Fragrant, creamy-white flowers on display hedge at the Garden Centre.